Today was mostly setting up camp. The area we are in is a cemetery, and the local Buddhists want the bones of their ancestors. Therefore we now have a lot of grave diggers in the area, but they are carefully watched. Weather is quite hot. As yesterday, could eat little for lunch. Just too hot and muggy. We are eating C-rations every meal. Some of the 101st Division are in the area. Tomorrow they are going up Rt 19 to An Khe, about 50 miles to clear the road again. Last night it rained for the first time. I stayed relatively dry. Today we continued to set up camp. Received word we may move out on Friday. Nothing definite yet. 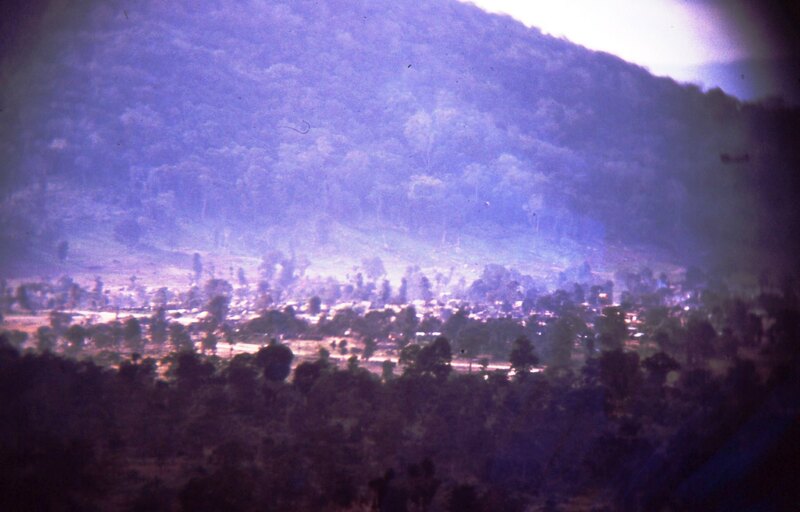 The area we are in is surrounded by hills on all sides. Marines are in the hills for security. The valley in the bottom is mostly rice paddies. We are up on the slopes at the base of one of the hills, with no trees or any other type of shade. The sun is still hot, but I am getting used to it. We are preparing to MOVE OUT tomorrow, up Rt. 19 to An Khe. 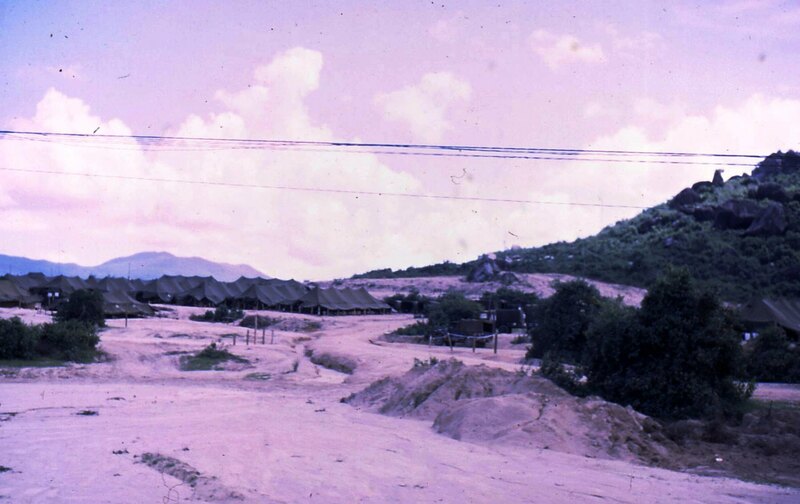 The village is half way between Qui Nhon and Pleiku…We will be there for approximately 2 months, building an airstrip and helipad for the 1st Calvary Division…I get free postage beginning the 1st of Sept.
Today we underwent our first convoy movement of 50 miles. We initially anticipated trouble along the way, but the 101st Div had Rt. 19 quite well secured all the way. There were no incidents. It turned out to be a scenic tour if you want to call it that. The people here as a whole appear to be quite poor. I have seen one automobile. The people either have bicycles or walk. There are a good number of bikes, but there are also a lot more walkers. The buses consist of small cart type scooters loaded to the hilt. Everything imaginable is loaded on the buses, from bicycles and straw baskets, to pigs and water buffalo. These are strapped to the roofs, hanging out windows and tied to the rear. Somewhere in the middle of all this the people manage to find a seat. Most houses are mud houses similar to those of Mexico, with thatched roofs. The doors, if any, are often made of what appears to be flattened beer cans. The windows are covered at night by the large woven baskets some about 5 feet in diameter which they use to dry or carry food. The mud to build the small one or two room home is dug out of the front yard in many cases. Today we spent all day setting up camp. Just like boy scout days, except we have larger tents. 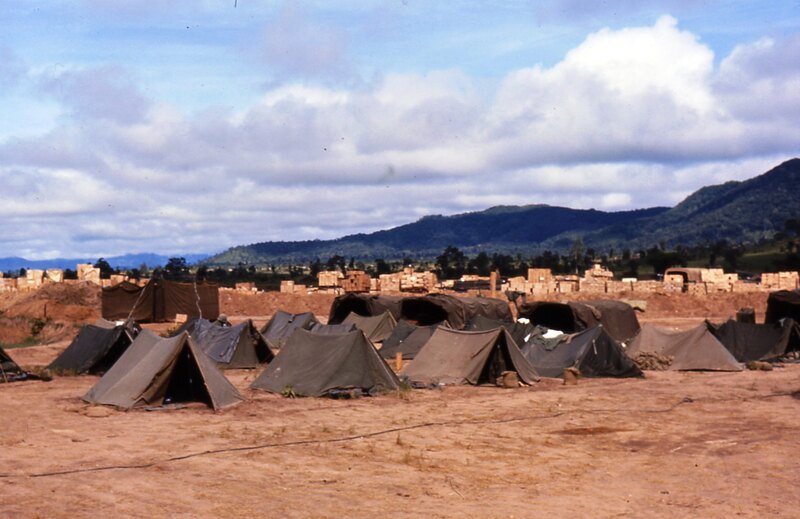 I am in a large tent which sleeps about ten, with the back half used as an eating area for the platoon. We built a table in the back which serves as an eating table, writing table, or any other use. We built wash racks in the back of the tent which holds 12 bowls. I went to town (I use the word loosely) and bought enough metal bowls for the company. What an experience! Communication is quite difficult when you do not know the language. I finally learned a few essential words and can speak their numbers. All money is paper money, ranging from 5, 10, 20, 100, 200, etc. dong, which is the unit of currency. I was fortunate to get into town, because it is now off limits to everyone. The buildup in this area is quite fantastic. Expansive plans are in the mill. 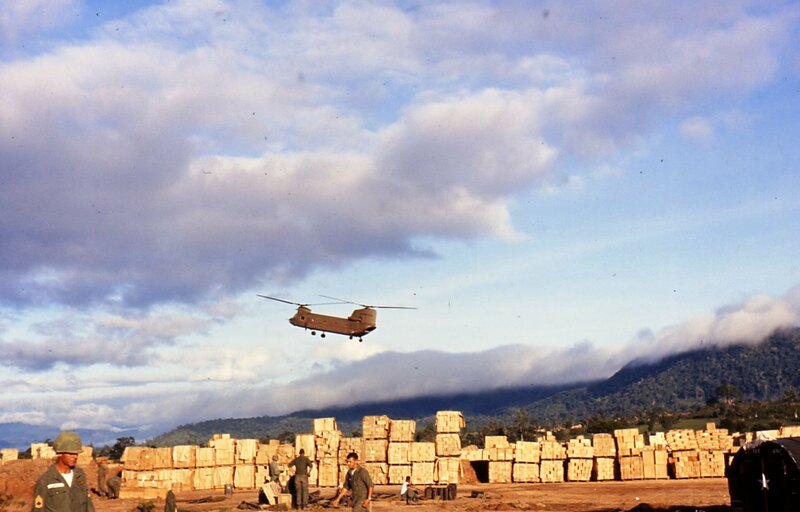 We are working on a heliport for the 1st Calvary Division, which will move to An Khe soon. If we stay in this area, we will have projects for some time to come. Have received no mail thus far, and do not know when we will. Probably nobody knows where we are! We spent all day in the field today clearing brush and undergrowth off the heliport. Killed one snake. Also killed one trying to go into the Commanding Officers (CO) tent. 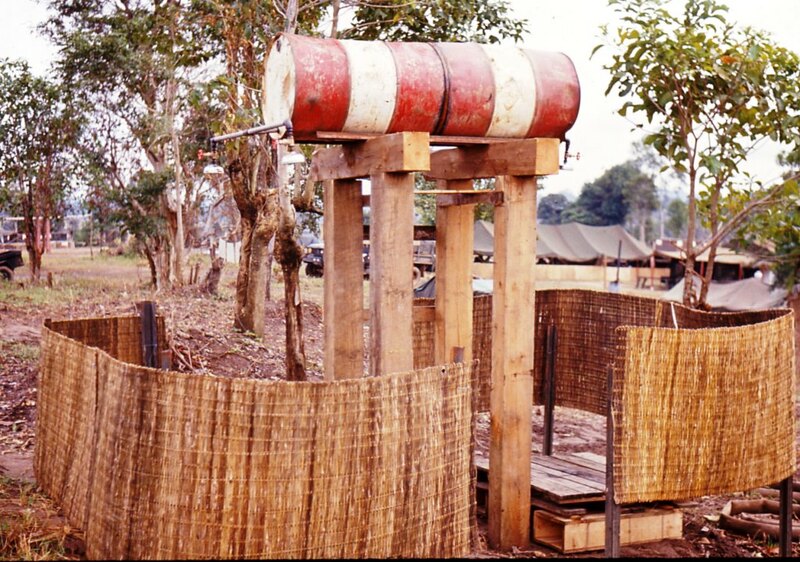 Still have taken no showers, but I sure have learned how to take a bath out of a steel helmet. Received our first big project today. 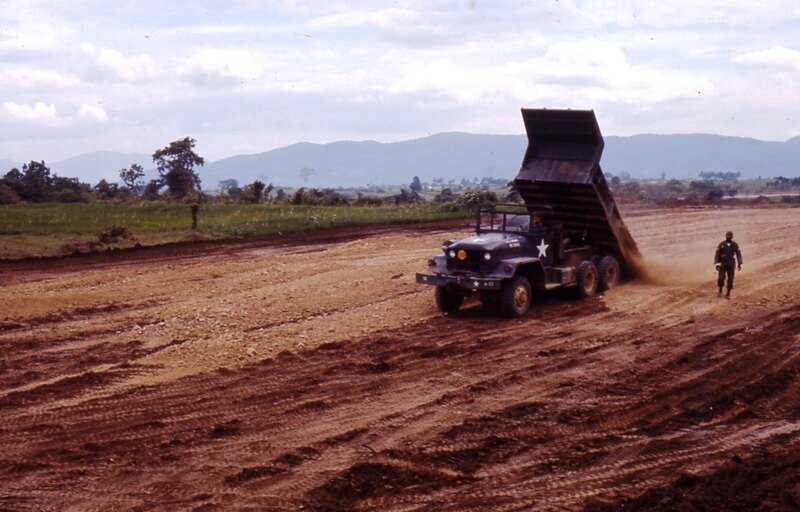 The company is building a road into the airfield area. Some areas are almost like a jungle, but even after today’s work the road is beginning to shape up. 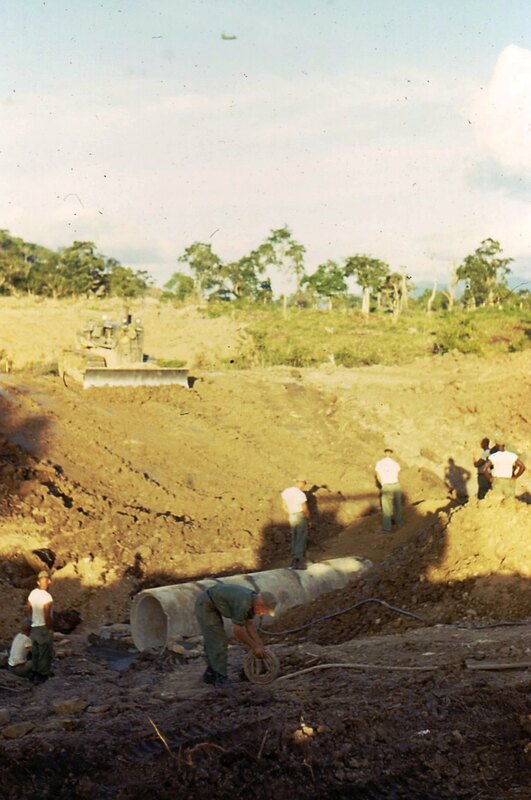 …We have been working 24 hours a day building a road about 4 miles long through thick woods. 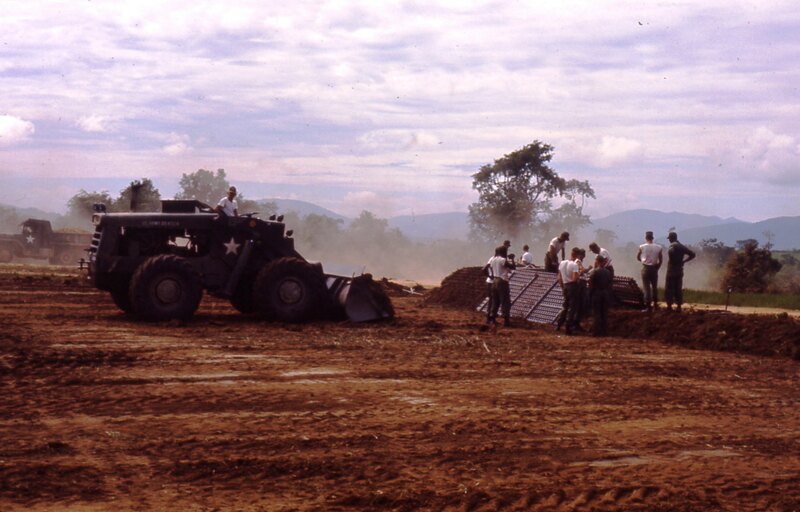 We are preparing an access road to the bivouac area for the 1st Cav Div which should start arriving tomorrow or early next week…So far we have had little VC opposition to our operation. C Company was fired on one night by a sniper, however I believe it was the 101st shooting each other. The guards get quite jittery at night, and have often fired at what later appears to be nothing. Incidents have occurred twice in the last week or so where VC have been contacted. 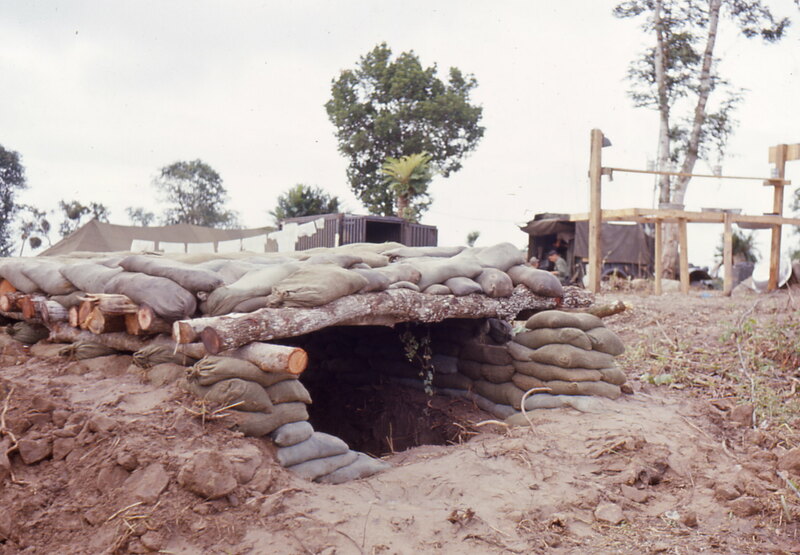 In one operation 7 VC were killed about 10 miles from here, and in another 5 were killed. The second was about 5 miles from here, and we could see two fighter planes making dives on the other side of a hill. Then last evening 4 VC were reported in an area about a mile from here. So tonight we are doubling security. Several more snakes have been killed in the area in the last week. Two were bamboo vipers which are highly poisonous. A person will not live for more than about a minute if bitten. The snake is bright green, about the color of a garden snake, but much bigger. One we killed was 3 feet long. I finally had my first shower the other day. It sure did feel good. The ice situation is still poor. All ice that we get comes from Qui Nhon or Pleiku, and the ice man was shot the other day, so we have none. The food is better. We now have B-rations, which is mostly dehydrated foods. I just got called back on the road. We have to finish by midnight and have a long way to go. We finished the road, but it poured down rain. One culvert that C Company installed was washed out. So yesterday we had to help them replace some and install new ones. 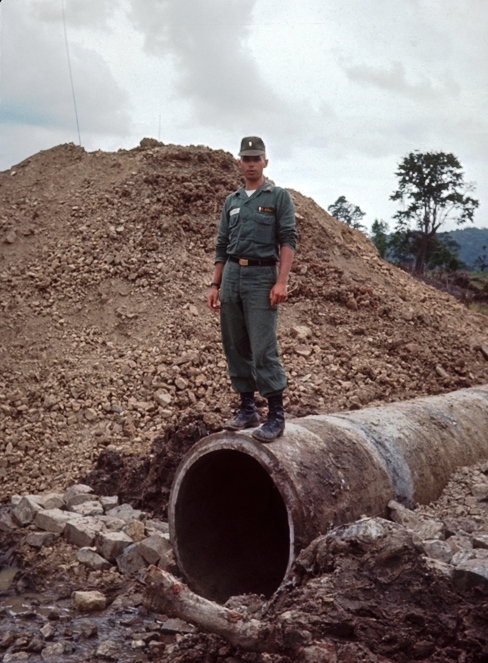 My platoon has put in over 6 culverts since we started. Incidentally, there were no incidents the other night. In fact it was quieter than usual. Yesterday I did have the life scared out of me. I was riding along our road in the back area when all of a sudden a number of artillery pieces opened up in the woods. I thought we were being attacked for sure. They were only about 50 yds up in the woods and firing directly over my head. They sure do make enough noise. The mail is coming in regular now. It takes about 5 days from the day you mail it. I get free mail now, which will save some postage. I built a foot locker out of some scrap lumber so I would not have to live out of a duffle bag. We were finally granted a 48-hour break yesterday and today. So we have been busy making improvements in the area. Our next mission is to build supply dumps. It is estimated 30 days will be required. Must go recon the area now. A lot of shooting took place last night around here. At the other end of the base, one of our squads was pulling road maintenance when they were fired on. Some infantry took off into the woods, as of yet I have heard no report. You said if I had a want list, just forward it. So here goes. No soap is available in the area to wash clothes with and razor blades are scarce. Yesterday we rigged up our own officer NCO shower. We welded two 55-gallon drums together and bought some shower heads. Was a little chilly, but sure felt good. I built a foot locker and a small book shelf to keep things within easy reach. The mail reaches me 5 to 6 days after you mail it. The fighting over in the pass ended with unconfirmed reports of as many as 150 VC killed and I know at least 12 Americans from the 101st were killed. 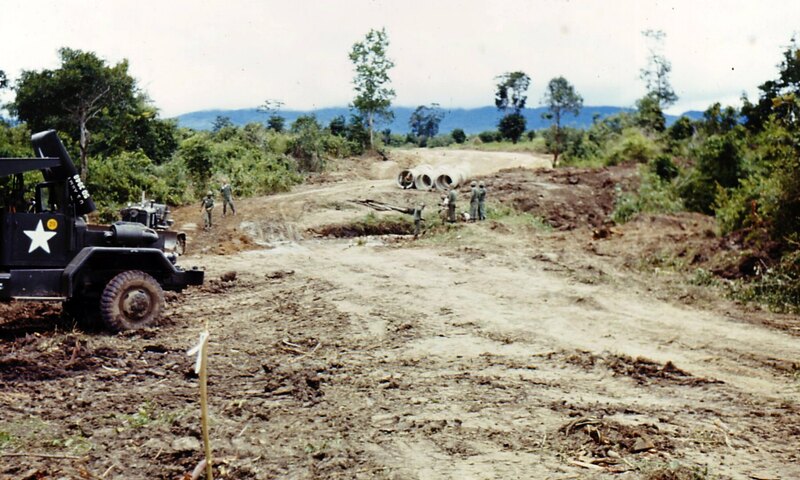 About a day later, 4 VC were reportedly killed on Hon Cong Mtn which is just across the street from our bivouac area. 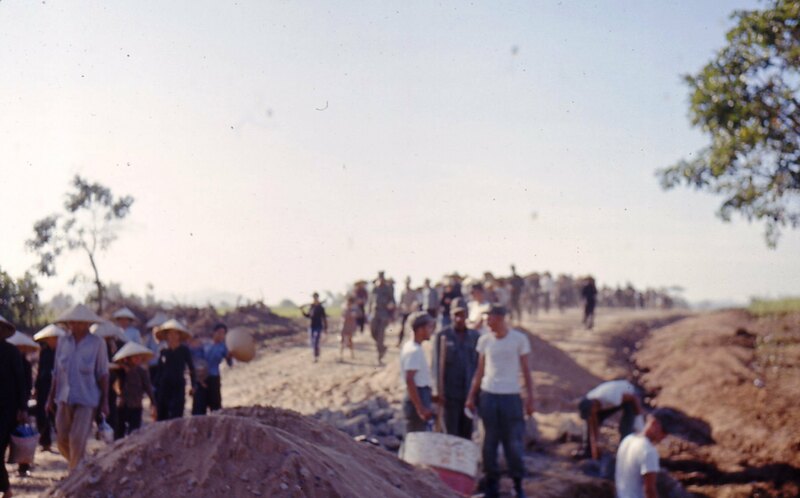 One of the Vietnamese workers who came into the area every day to cut brush was caught with a basketful of anti-personnel mines. Then last night while I was working at our job sight we were called back into the company area because of enemy activity in the area. The division headquarters was reportedly hit with one or two mortar rounds. So it appears that the action will pick up in this area, but we will plug right along on our project. I am scheduled to go back out on the job sight tonight. I hope we do not get called in again, because we are already a little behind. 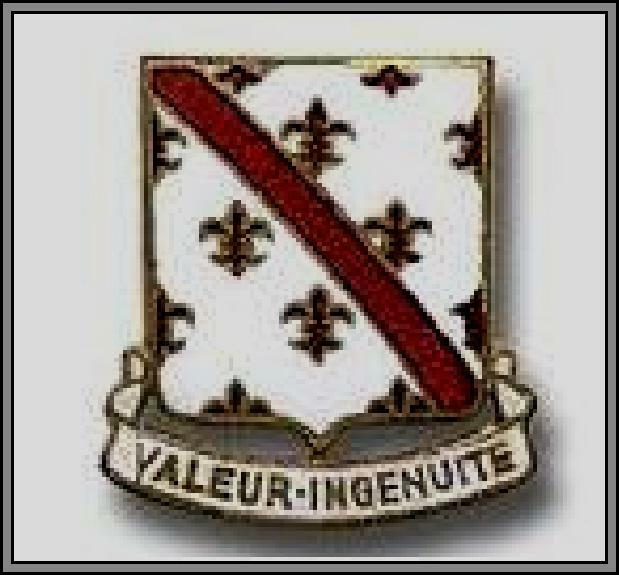 …The 1st Cav General would not let anyone dig foxholes on his “Golf Course,” as this area has been so appropriately named, until night before last when a few mortars were dropped in on his headquarters. So last night we ended up digging a large bunker in the back of the tent for protection in case we are hit again.